I have always believed that the Happy Birthday Author format worked for my former students because it exposed them to new literature. They were able to explore books they may have never picked up before at the school library. This time it was my turn. The name, Uri Shulevitz, was vaguely familiar to me when I pulled up a list of his books. There were so many that he had written, but I was only familiar with one of the books, Snow , a Caldecott Honor Book. I had time to write another article before Dr. Seuss's birthday on March 2, but I was so unfamiliar with his work that I didn't know if I could write about it. I immediately checked the local library's website to see if they had any books available to pick up the next day when I was to be there for story time with my children. I was excited to see that there were quite a few books available. I continued my research and there were a few things that caught my eye. I noticed that Shulevitz's first book, The Moon in My Room, was first published in 1963. Additionally, I found out that he received Caldecott honors (1 medal, The Fool of the World and the Flying Ship , and 3 honors) on 4 different occasions, and most recently in 2009 for How I Learned Geography . I immediately knew I was going to be reading books created by someone who has mastered their craft. My research also taught me that Uri Shulevitz used his talent as an illustrator to become a great author. It was an editor that urged him to write his own picture books after she did not have any manuscripts to offer him to illustrate. He never looked at himself as a writer, words never came easily to him. To complicate things he was new to the English language early in his career. However, he focused on his strength of visualization and used his art to document the pictures in his mind. The words then came simply and naturally from the pictures. His formula for creating pictures books has helped me understand how important the illustrations should be in a picture book. The words on the page tell only part of the story. The pictures should provide additional information that is essential to making the book believable and relevant. I had all this information at hand when I started reading his books. I read all the books through once. I paid attention to the detail of the illustrations and how they complemented the words. I was on my second time through the pile when when daughter joined me and was quickly followed by my son. We read a majority of the books in one sitting. My children's favorite picture book was definitely Snow. My daughter had actually read the story at her preschool this month. I was unaware that she read the book and she said to me as I was reading, "The boy knew it was going to snow, but the adults didn't." I feel this book is great at illustrating children's anticipation of a big snowfall and the joy they feel when it actually happens. As adults we dread the shoveling, the bundling, and scraping, but to children snow can be magical. My favorite picture book that I read by Uri Shulevitz this week was the Caldecott Honor book, The Treasure . I was lucky enough to find the audio book at our library too. The message of this story is that sometimes you have to "travel far to find something that is near". It is story about a man, Isaac, that has a dream about a location of a treasure near a bridge by the Royal Palace. The dream reoccurs and decides that he must go to the bridge. However, he discovers that the bridge is heavily guarded and cannot attempt to find the treasure. A royal guard questions him about his presence near the bridge and then laughs at his story about the dream. Isaac travels home to find that his treasure was not at the bridge but near him all along. I think I like this book the most because it was comes across as a simple book, but the message could be discussed at a much deeper level. I read two books that are based upon his Shulevitz's childhood; How I Learned Geography and his newest book, When I Wore My Sailor Suit . Each story's central theme is the powerful nature of a child's imagination. Imagination has the power to transport one on great adventures like in Sailor Suit or help escape reality like in Geography. Shulevitz childhood was marked by war in his homeland of Poland that lead his family to move around the world. There were times of great difficulty but he found stability in Israel where he began his studies in art. He later continued those studies in the United States in 1959 at the Brooklyn Museum Art School where his career in illustrating began. The life experiences that Shulevitz pours into his books, yet so different from mine, are enjoyable to read because I can remember imagining the world in a similar way as a child. I am so happy that I celebrated Uri Shulevitz's birthday at our house. It allowed my family and I to experience a new author that I normally wouldn't have stumbled upon at the library. If you are unfamiliar with Uri Shulevitz I urge you to give him a chance. I have only mentioned books that I have read personally, yet there are so many more. There is a "Comments" button at the bottom of this blog article to share your thoughts on the books I mentioned or other books by Uri Shulevitz that you enjoy. 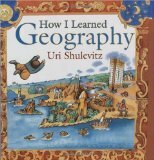 I welcome comments and hope that this blog becomes a place for families and teachers to discuss and celebrate wonderful authors such as Uri Shulevitz. I have to agree with your kids - "Snow" is my favorite too! Magical. His classic "Writing With Pictures" is also a pretty great read for anyone interested in the what goes on behind the scenes during the creation of a picture book.